Logo by Cyclops - Contribute your own Logo! How about 3D slices through the 4D Mandelbrot/Julia equation? I'm relatively new to fractals, but I have searched for hours to find a true 3D mandlebrot type fractal, all in vain. I don't want the raised mountain type of mandlebrot, and I don't want any true (but trivially simple) ones such as the Menger sponge. I instead want a true 3D equivalent of the mandlebrot (or near enough). However, that is still mostly self-similar. I want the amazing variety that can be found in the mandlebrot. Anything out there? (real and imaginary Z and real and imaginary C values) and hold one of the 4 values constant, while running the other 3 thorough a cubic grid of values? I would think this would generate very interesting 3D fractals. It would be a 3D slice through the 4D Mandelbrot/Jullia equation, where normal Mandelbrot and Julia sets are 2D slices. 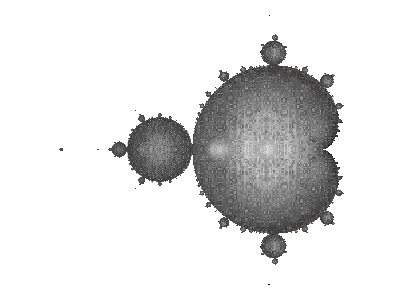 Re: How about 3D slices through the 4D Mandelbrot/Julia equation? Looks like it's not just us lot that have searched for the 3D Mandelbulb. I found some interesting threads in Google Groups from quite a few who seemed to wonder if such an object could exist. Notable posts include Erick's info about using arbitrary powers of n (instead of the usual n^2 in the main formula) to represent the third dimension. Also Laszlo's rumour indicates that the thing exists, and actually has a name (oops he's lost the reference - there's a surprise!). Finally, Lloyd Mitchell in this thread claims that "3d slices of the 4D Mandelbrot set (let the k part of c = 0) do reveal spheres instead of circular disks. ", and precedes that with formulae which maybe someone here can follow better than I can. Of course, I'm am very skeptical he's actually found anything. I'll come clean about the image I posted on December 04. It's not from any maths at all - I drew it in an art program...... :-} Yeah I know, seemed a fun joke at the time, though I'd be a lot more excited if I really found it. If you look carefully, you should be able to notice some discrepancies which indicate it's not the genuine article heh. I still think the 3D version of the Mandelbrot would look the best and most fascinating fractal ever (especially if we could make the surface multi-colored - not sure how easy that is, since the surface of the ordinary 2D Mandelbrot is always only a single colour). To find the Mandelbulb, I've tried everything from cylindrical coords to spherical-distance based rotations (instead of angle-based). Unfortunately, nothing's got closer than the one I posted earlier which Lycium rendered. "Also Mandelbrot curves have been discovered in cross-sections of magnetic field borders, implying there is a 3-D mandelbrot equivalent that is closely tied to electromagnetism and therefore a deep structural and fundamental aspect of life, and physical space/time." actually has a name (oops he's lost the reference - there's a surprise!). Finally, Lloyd Mitchell in this thread claims that "3d slices of the 4D Mandelbrot set (let the k part of c = 0) do reveal spheres instead of circular disks. ", and precedes that with formulae which maybe someone here can follow better than I can. Of course, I'm am very skeptical he's actually found anything. I think that the search for a 3D Mandelbrot analog depends on a suitable definition of a 3D number system. As has probably been pointed out, the more useful extensions of the real numbers have 2^n components, so there isn't a standard 3D system. Thus, you're free to define your own and see how it works with the Mandelbrot set. I can't remember exactly which multiplication I used, but it wasn't the quaternion one. Lol I take it what you said back then didn't produce what we're looking for (a Mandelbulb with bulbs on all axis) ? Hey glbn, that looks pretty cool! Obviously, it's not quite what we're after, but it looks quite nice regardless and although the chance is small, there are certainly areas which could hold more and more detail as you zoom in. As for me, I've almost given up (but then I always say that don't I? ). I'm exploring one last idea involving toroidal coords, which could be interesting. Oh, my deeply sleeping thread! which is not exactly equal to doubling the angles. ... but it leads to interesting pictures. no trigonometric functions at all, just additions, multiplications, divisions and a squareroot. IDENTICAL to twinbee's stuff except for the sign in z ! Since I'm sitting at an OLD Mac (350MHz) and try to use POV-Ray to produce pictures I can't show any yet; that takes TIME! But the first little "thumbnails" I produced show that this change of sign dramatically changes the resulting set! Forgive my ranting - I hope somebody might find these "simplifications" useful - twinbee thought so, at least! Yay, cracked it! I just added Karl's "if( abs(y) < really_small_value )" section, and that seemed to do the trick. The (orthographic) image seems practically identical to the old method (except a difference in 'pixel noise' which is expected really). I'm quite happy that someone made use of my mathematical gymnastics - finally, I might add. I only managed a 4-5x increase on my setup. If you do get a new CPU, you might want to treat yourself to a quadcore Q6600 from Intel. I've never loved a CPU as much as this, and it's been getting tons of 5 stars from Amazon - it's amazing for multitasking lots of progs simultanesously too + it runs quite cool (at least with the G0 stepping version). OK - that's not THAT much, but it's SOMETHING. Haha, I'm just spoilt I'm guessing you got similar results too? I wonder if there's a program to simplify all the sine/cosines like you've done. It can't be easy - probably comes under advanced algebra I'm guessing. Thanks again for the results! Hi twinbee, I'm a brand new member here. I stumbled upon your page (http://www.skytopia.com/project/fractal/mandelbrot.html) on my quest to understand how to render the "whipped cream" Julia quaternions. I've always liked how they look... but there's something missing... I was so glad to find your page documenting your attempt to find this object. Ever since I wrote my first crappy Mandelbrot program (probably ten years ago), I've had the same question you do, about a "true" 3D Mandelbrot fractal solid. I just wanted to post to let you know that I understand EXACTLY what you're looking for, and why its so enticing. I briefly searched for this thing years ago, but gave up pretty quickly. Some of the images I've seen here and on your page make me think that it does exist though. lyc, it seems that most of your renders attached to your older posts are gone, are those still available anywhere? I use my TI89 frequently (it uses a program called Derive). There's also Mathematica, and Maple. Matlab has a symbolic manipulation package that just uses Maple.